Mike (AKA my husband) got the first paycheck from his new job, found out he passed (just barely) his anatomy exam and rode a mechanical bull without killing himself at work (yes, they had this in the office during work hours). Each is sufficient reason on its own to celebrate but all of them occurred on the same day so we could not pass up an opportunity to stay up past our 10:30pm bedtime. The method of celebration…dinner and a movie. Remember in the 90’s when movie theaters attempted to go upscale by providing a dining experience while watching the latest release. In my small city, Harrisburg, Pennsylvania, we achieved this with paper plates, plastic forks, poor service and cold food much worse than what you’d get at Burger King. Odeon Lounge has brought this concept into the 21st century. OK so the tickets are a bit pricey (£18 per person) but so worth it. When we arrive, the concierge ushers us like VIP’s past the peons queuing for the regular theater. After ascending the stairs we arrive in what is about as close as it gets to our version of heaven. A giant bar with a sparkling high brow liquor pyramid accented by dark wood and stainless steel. Leather seating skirt the walls paired with knee high tables and flickering tea lights. The atmosphere is like the most exclusive lounge in London. The maître d’ gives us the lay of the land and offers us a seat while we wait for our screen to open. 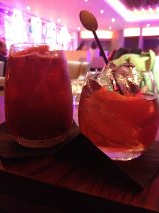 The drinks menu was extensive with meticulously chosen concoctions that my husband says are indicative of a real mixologist in charge of the bar. My drink, the Fruity Fizz, a non-alcoholic cocktail of ginger beer, raspberries, blackberries and strawberries was so good that I was a little concerned that it might just have a touch of something (but it doesn’t). Mike’s drink, Perfect Bourbon Manhattan, was one of the best he’s had (and that’s saying something for a guy who has imbibed more than a few cocktails in his day). About 20 minutes before the start of the show, the staff walked us into the screening room to our pre selected assigned seat. All leather loungers make me feel like I’m on a Delta business class flight across the pond. With a push of a button I prop my legs up and get ready to combine my two most favorite things in the world, food and film. 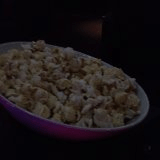 The British have absolutely no clue how to make movie theater popcorn. In most theaters, movie-goers receive popcorn shipped in a big bag that’s kept in a store-room. Teenage cashiers heap it into heated compartments at the concession stand to simulate freshness. I’ve never seen a real popcorn popper at the cinema. Oddly enough, the British think that butter on popcorn is an impossibly grotesque concept (despite putting butter on every type of sandwich imaginable). The waitress brought our warm freshly popped popcorn in a lovely ceramic bowl and it was, quite possibly, the best popcorn I have ever had. Someone American must be running this joint. We looked down about five minutes into the show to realize that only a few measly kernels remained. You could almost hear the chirping whistle indicative of a shoot out at the OK Corral as we each eyed the last plump buttery white puffs. A few minutes into the start of the movie our meals arrived. The menu isn’t extensive but what’s there is meant to fancify movie food. The fish and chips that I ordered were almost perfect. The five crisp nuggets of white fish battered lightly and hot from the kitchen had only one problem…they lacked a dash of salt (and some hot sauce but that’s pushing it). Unfortunately, despite pressing the waitress button a couple of times, no one ever showed up to bring me any. Mike’s fried calamari was well seasoned and the portion was enough to fill him. Mr. Fried Calamari Expert loved it. One side question that I know you’re probably interested in…didn’t the waiters get in the way? No, you barely notice them and one of the theater’s selling points is that the wait staff has uniforms made of special material to eliminate the swish-swish sound of their pants (trousers for you British) as they’re walking the floor. Now this wasn’t a cheap evening – £37.50 for the tickets and £47 for our two meals, two drinks, popcorn, a small water and service (gratuity). Was it worth it? Absolutely yes. This isn’t something that most can do every weekend but, for a movie lover, it’s a really nice way to celebrate those special times that come up in life. Previous Post Hooray for Pancake Day! You guys should check it out the next time you’re in London. It was a really nice experience. I’ll be posting soon about a great burger we found.